This Wiveton Summerhouse is 3.6 x 3.6m in size, the biggest one we make, and it has been installed in our customer’s garden in Woodlands St. Mary, Berkshire to use as an entertainment focal point for their friends and family to enjoy in the summer. At a size of 3.6 x 3.6m and octagonal in shape, the customer will be able to fit a large dining table and chairs inside for a bit of alfresco dining, or they could put some comfortable seating inside to relax in, whichever suits them best. Grey slate effect tiles have been used on the roof, which will offer 50+ years of protection against rain, wind, hail, snow and fire, while also looking very attractive. The colour of the tiles has been paired with the paint colour, Lizard, which is a natural green colour from our Valtti colour range that offers an opaque coverage of paint. Leaded windows add a traditional touch, and inside there is natural matchboard lining on the walls, and insulation in the walls and ceiling. 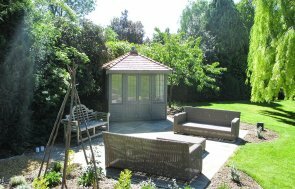 If you have a large garden, or a garden that you would like to see from several different angles, then a Wiveton Summerhouse may be a good option for you. 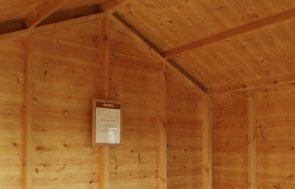 For different styles though, please take a look at our full range of Summerhouses, as well as our Garden Studios and Garden Rooms to see if they any closer to what you’re looking for. Please call us on 01760 444229, Contact Us or Request a Callback to ask us for more details. You can also visit our Newbury Show Centre to see our range of Garden Buildings up close.